Which Blade Should I Use for Cutting Porcelain Tile? 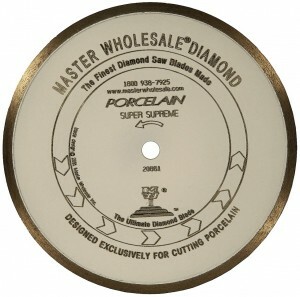 We get a lot of questions about which wet tile saw blade is the best for porcelain tile. Porcelain tile is a hard material that chips relatively easily. Turbo rim blades cut quickly but will chip the tile more readily. Narrow continuous rim blades cut with minimal chipping, but they can wander slightly due to the flexibility of the blade face, producing less than straight cuts. 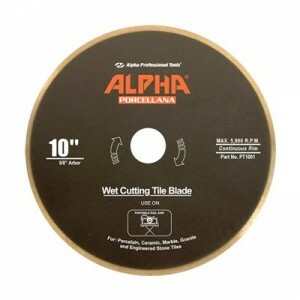 There is no single blade that does everything perfectly, but the Alpha Porcellana and our Master Wholesale White Porcelain blade do a very good job at providing a faster cutting, chip free blade. Both of these blades are only for cutting porcelain and will deteriorate quickly if used on other materials. 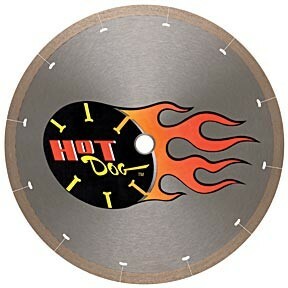 If speed is the most important factor, I would go with either our own Green Hornet blade or the MK Hot Dog blade. 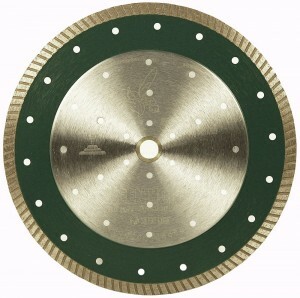 Both are very thin rim blades, but the Green Hornet has a thick center for accuracy and stability. The Hot Dog is a great blade but it can wander when pushed for speed. If speed and accuracy are paramount, go with the Green Hornet. If speed and chip free cutting are the most important features, you can’t go wrong with the MK Hot Dog. Both of these blades can perform well on other harder materials as well, just avoid the softer stones such as marble. With speed also comes a decrease in the lifespan of the blade. This entry was posted in Reviews and tagged diamond blades, porcelain tile blade, best porcelain tile blade, tile cutting blades on July 30, 2014 by Badsero. 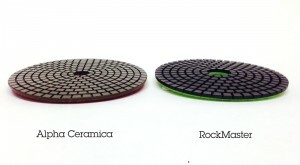 All granite wet polishing pads are not created equal. I’d like to give you a comparison based on my 20 years plus in the business. Diamond Resin Polishing pads differ in thickness, stiffness, the diamond matrix composition. The come in individual grits, and in sets of 3 to 8 pads. We have seen just about every pad from every vendor, and sell hundreds of these a month. If you are looking for the best quality finish, you will want a full pad set, which contains various grits that start coarse and go up to around 3000. The As you would expect, these kits give you the finest quality finish, and preserve the pads because each one does less work. The trade-off is time. It takes time to switch pads. Three step pad sets will produce a satisfactory job on the typical spec home granite counters. If I was working on an installation for a custom home, or any higher end home or commercial application, I would avoid 3 step pads. The end results just don’t quite match up. That said, some of our customers get pretty good results combining a 3 step pad with a 5000 and 8500 grit and that does produce a much nicer shine than the 3 step kits get on their own. The lifespan varies from pad to pad, with the coarser grits wearing out first as they do the bulk of the work. As a general rule, across manufacturers, there is usually a direct correlationthe between the thickness of the diamond resin and how long the pad will last to last. If the cost is no concern, I’d use the the Alpha DIA Ceramic pads every time. They are flexible so easy to manipulate, they last as long as any of the other pads we carry, and they produce a great shine every time in the right hands. They also are very pricy. Our RockMaster pads are my second favorite pad to use and just a little over half the price of the Alpha set. Our kit includes an additional pad as well. These will produce a comparable shine to the Alpha pads, as will our E-Pad set. The E-Pad set is a tremendous value. They don’t last as long as the standard RockMaster pad set, but they produce similar results at the expense of just a bit of longevity. You’ll get about 25% more life out of the standard RockMaster set. We also like the Cycle 3 step pad set if speed is important. They did a good job with these pads and the results are good, especially considering the time it takes to finish the job. 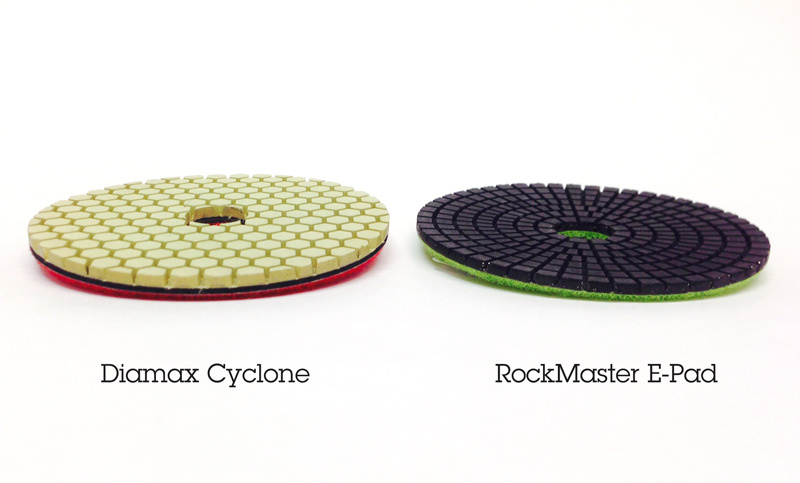 We hope this helps you in your quest to find the right polishing pads for your job! This entry was posted in Reviews on July 16, 2014 by Badsero.